Letterboxes were only introduced to people houses around 1850, prior to this letter receiving houses were the main source of a postage system. Who would believe 163 years later, every building in the UK would have a registered postal address, with letterboxes designed in various different sizes, colours and styles. Letterboxes have adapted to include many features such as additional security, anti arson protection, multiple letter plate openings and much more. 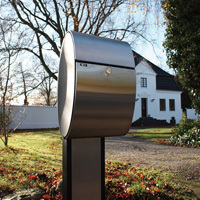 Both freestanding and wall mounted letterboxes are available to the public, a choice many would have desired years ago. In ever changing generations, the postal system have had to adapt to transporting not only letters, but parcels too. With this addition to the postal system, further pressure was introduced when Internet shopping was born, with popular parcel sized boxes being manufactured, in order to receive the packages. Our latest contemporary range of Scandinavian designer letterboxes are exclusively sold by us. These robust designs have been manufactured with security, space and weather protection in mind. Certain models, like our Ellipse Letterbox focus on further features, such as noise reduction and thermal co-efficiency too. Who knows how much letterboxes will adapt in another 163 years times.